The Deer Creek Lodge and Conference Center with its beautiful sprawling grounds in Mt. Sterling is a popular venue for weddings. 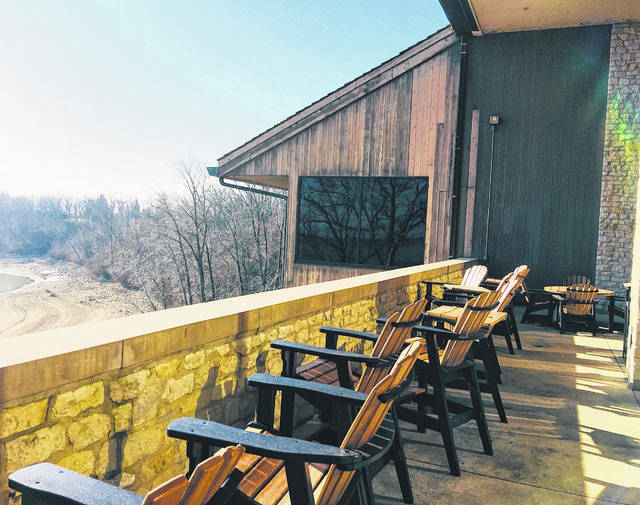 Stunning rustic panoramic views are abundant at Deer Creek Lodge & Conference Center. The Deer Creek Lodge and Conference Center is just over an hour from Indian Lake. MT. STERLING – Let’s face it. Winters are not easy at Indian Lake. It’s cold and icy and messy. Sure you can make the best of the winter season with adventurous activities such as ice-fishing, snowmobiling, ice-sailing and the sort. But come on, it was a tough winter and we could use a break now. It’s time to put these Winter blahs behind us and look forward to something fun. What’s the best way to do that? Well, a weekend getaway sounds like a winner to me. It doesn’t have to be very far away, nor for an extended period of time. Just a day or two away will do wonders. If fact, save your two weeks of vacation for the summer, because you can take a weekend-wonder-getaway to nearby Deer Creek on a mere tank of gas for a couple of days, and you will never feel so far away yet be so close to home. It’s the perfect solution for the Indian Lake Winter blahs. Many may not have even ever heard of Deer Creek Lodge and Conference Center, but it’s only a little over an hour drive from Indian Lake. If fact, it’s the closet of all the magnificent Ohio State park resorts to Indian Lake. So let’s start a new annual end-of-winter tradition at Indian Lake by jump-starting the year at nearby Deer Creek. It’s just what the doctor ordered to cure those Winter blues. This place has it all. 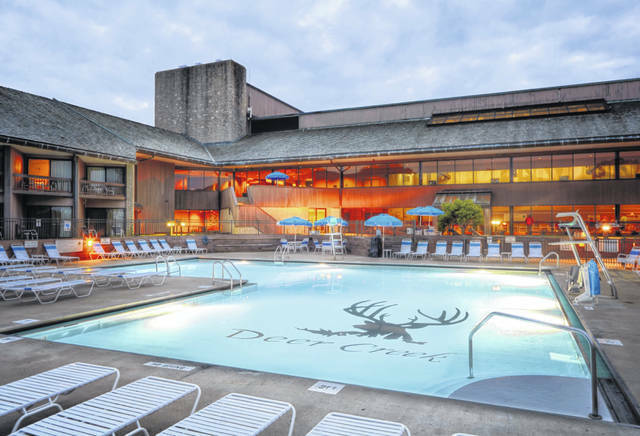 Deer Creek Resort Lodge, Conference Center and State Park is a first-class family resort that has really been undiscovered and overlooked by many. Located in Pickaway and Fayette counties, southwest of Columbus, just outside the small town of Mt. Sterling, lies this luxurious 110 room resort lodge with breathtaking, panoramic views of tranquil Deer Creek Lake and its sandy beaches. Not only does this fun-filled lodge await you, the attached 3,100 acre state park is a virtual adventure playground overflowing with attractions and activities for everyone in the entire family. The resort lodge has a large outdoor swimming pool and a gigantic indoor pool. Relax in the sauna or in one of the indoor or outdoor hot tubs. The kids can hang out in the activity room for a great array of supervised games, nature projects and organized activities. The kids can make crafts, play games and even play outside at the children’s playground. A large game room with arcade games is also located in the lodge. For you big kids, Deer Creek offers every amenity you could imagine. Work out in their high-tech fitness room or sharpen your golf game on the practice putting green just outside the lodge. Try your hand at horseshoes or play a game of shuffleboard. The fun is endless with billiards, hiking, tennis, miniature golf, sand volleyball, disk golf, fire pits, archery, gun range, bicycle rentals, basketball and even a baseball diamond to choose from. If you like golf then you’re in luck with a 350 acre, 10 pond, 52 traps, 18-hole championship golf course, complete with a pro-shop and clubhouse awaiting you. Now, if all these fun activities have you a little worn out by now, then it’s time to unwind in one of the lodge’s 110 spacious modern rooms, many with breathtaking views of the lake. Sit out on your own private deck for a quiet moment as the sun sets on tranquil Deer Creek Lake . Enjoy an occasional visit from the friendly critters roaming the lakefront and maybe get a photo or two of a possum or deer. After you get the family rested, head down to Rafters Restaurant which is located inside the lodge, for a dining experience you won’t soon forget. Enjoy one of the best steaks you’ll ever sink you’re teeth into as you savor the panoramic views of the lake from your dinning room table. With a bistro style menu in a rustic atmosphere with sophisticated dishes, and reasonable prices- what more could you ask for? Be sure to check out the lodge’s great gift shop, which offers a wide array of local folk art, jewelry, souvenirs, clothing, toys and snacks. But don’t call it a night without kicking back at the Harding Lounge and relaxing with your favorite drink while catching a ball game on the big screen TV. At the park’s fully equipped marina, visitors can rent jet skis, pontoon boats, kayaks, fishing boats, ski boats, canoes, rowboats, hydro-bikes, pedal boats, paddle boards, deck boats and sailboats. If you like the great outdoors then this is the place to be. Deer Creek is famous for its spring saugeye fishing below the dam. Hiking enthusiasts will discover seven trails that traverse dense woods, swampy marshes as well as the shoreline of majestic Deer Creek Lake . Wildlife viewers and photographers can observe the numerous mammals that inhabit the park including the red fox, white-tailed deer, ring-necked pheasant, raccoon, possum and groundhog. Mountain bikers should bring their bikes for a tight and twisty ride on the park’s 1.2 mile scenic mountain biking trail near the beach. For beach goers, an incredible 1,400 ft. sandy beach graces the shoreline on Deer Creek Lake . This phenomenal beach is great for lake swimming, sand volleyball, kite flying, feeding seagulls and walking. Changing areas and concessions are available in the large beach pavilion building. A designated boat-swim area is also available for boaters on the lake. Your new annual get-a-away is closer than you think at nearby Deer Creek Resort Lodge and Conference Center.